The magician asks an audience member to take ANY card and sign it. The card is then placed back into the deck. Next, the magician introduces his pet "duck". The deck is placed into a card holder that sits next to the duck. 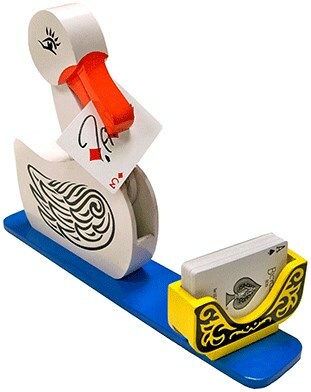 The duck looks at the deck then instantly lunges forward and selects a single playing card. This card is taken from the ducks mouth and is shown to be the signed selection. This classic of magic has a lot of comedy potential. A must for cabaret performers!